This old establishment was situated in Bell Street just off High Street, it has now been demolished with flats being built on the site. To read the full history of this once popular bar click here. This old pub was formerly called the Pop Inn. Interior view's of the Pop Inn. 1936. The pub was refurbished in 1936, Mr Kelly the proprietor stripped the four walls of this old pub, he erected a new center island gantry with an oval surrounding counter. 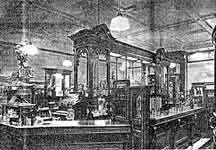 The gantry was well designed in mahogany, concealed lighting showed off the display of drinks on the shelves. Around the walls he had constructed eight cabins (small rooms,) with rounded fronts, each would have accommodated about eight to ten people. Upholstered seating was installed in each room with new non-burnable tables, all double tiered. In the far right corner was a lunch, dining and supper room, the pub enjoyed the advantage of the supper hour. Ladies were now allowed into the premises, new toilets were installed for their purpose. Beyond the dining saloon was the kitchen, fitted with all the mod cons. A feature of the pub was the coloured glass vestibule at the entrance, an old leaded partition picturing some of the heroes of the South African War, Generals Roberts, Buller and MacDonald, purchased on the demolition of old licensed premises elsewhere in the city. 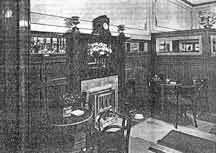 There were two fireplaces, one on each side of the room, one a coal fire the other electric. The floor was covered in Lino. The pub was now called the Pop Inn Restaurant. 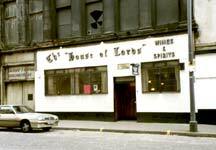 Also read the history of Mr Kelly's other public house at 70 Cowcaddens "The Pop Inn."